MARTINSVILLE, VA — Joey Logano won the First Data 500 at Martinsville Speedway after losing and retaking the lead on the final lap. For the final five laps Logano battled door to door with Martin Truex Jr.. Truex fully sent his No. 78 5-hour Energy/Bass Pro Shops Toyota in turn one, clearing the leader. Logano followed in his tire tracks down the backstretch, and in turn three he pushed him up the lightly banked racetrack. The two contenders were side-by-side as they rolled through turn four, but Logano wasn’t done yet. He again got into Truex on corner exit. Truex nearly wrecked from the contact but made sure to come back down and knock into Logano. In the end Logano held on to his car and scored his ticket to the championship round in three weeks at Homestead-Miami Speedway. “Miami,” said Logano, on what he was thinking when he made the move on last year’s champion. “Just thinking about Miami. “You know, we didn’t wreck each other. We bumped into each other a lot and that is what this sport was built on. I know a lot of fans out there aren’t too happy about it but it is racing and that is what NASCAR is about and what stock car racing is. Logano and Truex battled down the stretch in the First Data 500. Photo by Jonathan McCoy. Logano’s team owner, Roger Penske said from his “perspective Joey [Logano] drove a great race. Cole Pearn, Truex’ crew chief wasn’t as meek, saying, he’s “not surprised coming from him, that’s just the way he drives. From the start, Kyle Busch led the way. On lap three he was already one second ahead of second place, Hamlin. The first cars to go a lap down were that of Joey Gase, Timmy Hill, and Hermie Sadler. They were lapped by lap 22. Hamlin reached Busch by lap 30, eliminating the original lead. On lap 31 Hamlin went under Busch in turn three, with Clint Bowyer close behind. Jeb Burton struck the turn two wall on lap 43, sending the First Data 500 into its first caution period. Busch retook the lead on pit road during the caution while Alex Bowman accrued a speeding penalty, sending him to the back of the field for the restart. Logano gained positions on pit road as well, when the race got back under way on lap 50 he was on the outside of the front row, second to Busch. On the inside of Erik Jones, Jimmie Johnson wheel hopped his car in turn three on lap 72. Johnson, a seven time series champion, kept his car away from the wall. His spin brought out the second caution of the race. The majority of the frontrunners opted to stay on track. Aric Almirola, who’d been complaining of a loose condition missed his opportunity to pit when his team gave the code word, “bacon,” after he’d already driven passed the commitment box for pit road. Like before, Busch commanded the restart and drove away from the field on lap 77. 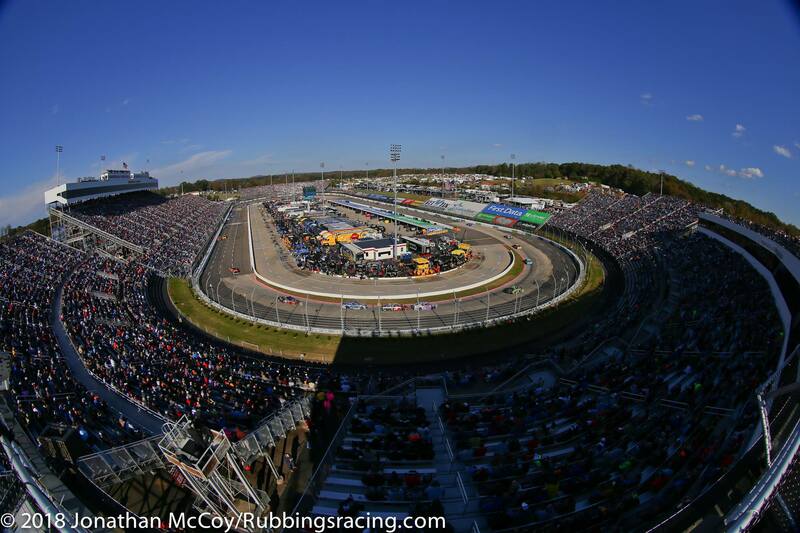 Martinsville Speedway hosted a thousands of fans for the first race in the Round of Eight Sunday afternoon. Photo by Jonathan McCoy. For the first 100 laps, Hamlin, Logano, and Bowyer battled for position inside the top-five. Busch would pull away in the first laps after a restart but as heat wicked into the tires Hamlin would begin to reel in his Joe Gibbs Racing teammate. The pair were side by side for all of lap 115, on the exit of turn two on the next lap Hamlin took the lead from Busch, who’d been slowed by a gaggle of slower cars. Erik Jones, another teammate of the front pair, was among the drivers fighting to stay on the lead lap during the battle for the lead. 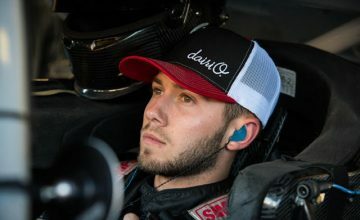 In the hustle his left-rear quarter panel was crunched and damaged but it didn’t puncture his tire, enabling him to drive to the stage one caution. Hamlin won the first stage; stealing a playoff point from Busch, or any of the other seven playoff drivers. Logano, who’s the lone Team Penske driver still in championship contention finished second while Busch was third. The only driver to miss out on stage points in the first stage was Chase Elliott, who raced across the line in 11th. Logano returned to the lead when he emerged from pit road first. 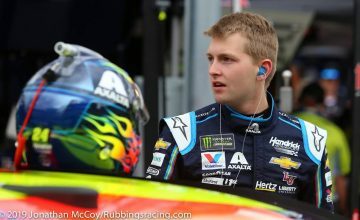 During that round of pit stops, 20-year-old William Byron found himself facing the wrong direction on pit road. When he went to stop in his pit box the rear-end of his No. 24 Liberty University Chevrolet was given a shot from Bowyer, sending him for a 180 degree spin. Among other pit road mishaps, Ryan Blaney’s crew was charged with an uncontrolled tire. The mistake by the pit crew sent Blaney to the rear of the field for the start of the second stage. Logano continued the tradition of leaders getting a good restart at the beginning of stage two. By lap 145 he was 1.8 seconds ahead of second. Martin Truex Jr. passed Bowyer for fifth on lap 172, completing his march to the top-five after being forced to start at the rear of the field for failing post qualifying technical inspection. When he made the pass, the two drivers banged doors through turn three and Truex even hopped up on the pink curbing along the inside of the race track. The second stage was run clean of any abruptions. Logano won the stage but had to work for it over the final laps. Facing a group of slower cars Logano’s progress was slowed. Hamlin caught up to the No. 22 Shell/Penzoil Ford Fusion. 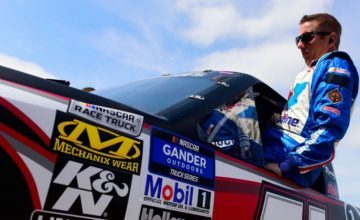 After placing fellow playoff contender, Kevin Harvick a lap down, Logano sought to put Johnson behind as well; however, he was unable to get around the No. 48. Forced to try the outside, Logano opened the inside lane for Hamlin. For the final four laps the two rival drivers raced door to door through the straightaways and turns. On lap 260 Logano beat Hamlin to the start/finish line by no more than half a car length. During the stage break caution Logano’s team warned him about the threat of rain. “I don’t think it’ll be a day ender,” said his spotter, not anticipating the weather to affect the end of the race but wanting to make sure his driver was aware the intensity was going to increase. That being said, when the race restarted on lap 269 the entire half mile race track was under cloudy conditions. 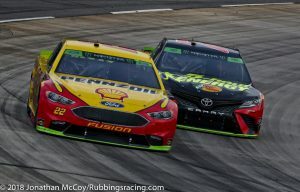 Truex started the final stage just outside of the top-five but by lap 340 the 2017 MENCS champion had driven up to within half a second of the leader, Logano. By this time most teams were positing that the rain would begin to fall within 10 minutes. On lap 354 Truex began his battle for the lead. He nudged the rear of Logano through turn two and then stuck his bumper under him in turn three. For five laps Logano left the inside door open while he focused on diamond-ing the corners. On lap 360, with dark clouds streaming deeper across the October sky, Truex completed his pass for the lead in turns one and two. 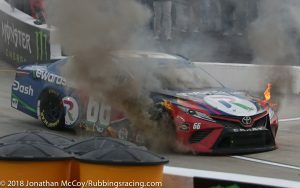 Timmy Hill’s car was set ablaze on lap 383, ending his race and leaving him in 38th place. Photo by Jonathan McCoy. On the restart Truex returned to lead but after a few laps was passed in turn two by Logano. Then, moments later Hill’s No.66 Rewards.com Toyota had a mechanical failure and erupted into flames at entrance to pit road. NASCAR was forced to throw a caution. Larson’s race ended when his car failed on lap 398. Photo by Jonathan McCoy. around to the outside of turn four. Logano led on the restart but Brad Keselowski, his teammate gave him a small bump in turn three. The bump was enough to open the door for Keselowski. A lap later he completed the pass for the lead. Truex restarted from second but was sliding loose on exit. Within a handful of laps he had dropped back to sixth. On lap 458 Bowyer spun out in turn four with some assistance from Johnson. He hit the outside wall but was able to continue with minimal damage. Under the caution all 16 lead lap drivers took their cars to pit road. Logano won the race off pit road, beating Busch, Keselowski, and Hamlin. Logano pulled to a sizable lead on the restart but behind him rubbing was racing. Keselowski roughed up Busch before getting around him. In the next turn Busch returned the hard-nosed favor but was unable to complete the pass. Quickly, Logano’s lead was erased by Keselowki, bringing the delta within half a second on lap 474. The battles were fierce further back in the pack. Chase Elliott doored Ryan Newman in turn two on lap 477 to move into seventh. At one point Kevin Harvick looked to make it a three-wide battle but thought better of it. Closer to the front Busch followed Keselowki to the leader but in the meantime he had to fend of a determined Truex. Lap after lap they were bumper to bumper in the corners while simultaneously running down the top two. Truex made the pass with under 15 laps to go but was within one second of the leader. Keselowski was spending every lap looking to setup his teammate. On corner he’ll enter high hoping to cross over on exit, on the next corner he banged his front bumper with Logano’s rear. With 10 laps to go Truex dove under Keselowki and moved up into second. 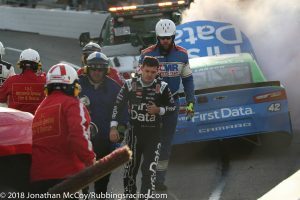 In a thicket of traffic it was suddenly a five car battle for the lead, as Hamlin had driven up to the leaders as well. Truex got underneath Logano on lap 494, using a lapped car as a pick in turn three. With five laps to go they began racing side by side, nearly every corner there was contact between the two playoff drivers. On the final lap Truex cleared Logano in turns one and two. In turn three Truex put his bump to Logano. Coming off the final turn of the final lap Logano pushed Truex up the track, sending them side by side, racing towards the checkered flag. On the exit Logano bumped Truex again, sending him into a slide. Truex scooted down into Logano, making them both lose grip. Hamlin, who’d gotten up to third drove straight off the corner hoping the two leader would finish each other off. The three drivers careened towards the finish. Hamlin beat Truex to the line but he wasn’t the first to checkered. Logano won the First Data 500 by one tenth of a second.